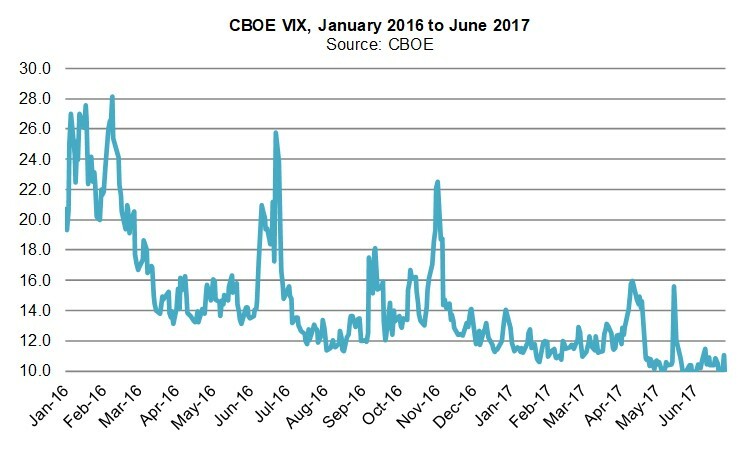 The global listed derivatives market has been characterized by sustained low volatility throughout the first half of 2017. Boston, October 12, 2017 – For the 12-month period since Q2 2016, global derivatives trading volume has stayed fairly stagnant overall, with periodic and short-lived surges. Super-high-speed computing enables participants to react to news and events, and fire off thousands of algorithmic orders in mere milliseconds, resulting in market volatility that is hard to sustain beyond a few minutes, let alone a few hours or longer. As trends become harder to sustain, many traditional trend-following traders are becoming increasingly reluctant to trade. This Aite Group midyear report provides the latest developments on global regulation that will shape the derivatives industry, analyzes the volume trends and market dynamics in global listed futures and options trading (from the start of Q3 2016 to the end of Q2 2017), and examines the total open interest count in order to gauge the sustainability of trading activity for the rest of 2017. It is based on an amalgamation of publicly available macroeconomic data, market data, and information as well as conversations with derivatives industry veterans from June to August 2017. This 61-page Impact Report contains 28 figures and one table. Clients of Aite Group’s Institutional Securities & Investments service can download this report, the corresponding charts, and the Executive Impact Deck. This report mentions BIS, BM&FBovespa, Bombay Stock Exchange, Borsa Istanbul, Borsa Italiana, Budapest Stock Exchange, CBOE, CFTC, CME, Dalian Commodity Exchange, U.S. Department of the Treasury, European Central Bank, European Securities and Markets Authority, Eurex, Financial Accounting Standards Board, Federal Reserve Bank, FIA, Hong Kong Exchange & Clearing, ICE Europe, International Organization of Securities Commissions, ISDA, Johannesburg Stock Exchange, Korea Exchange, LCH Clearnet, Moscow Exchange, OneChicago, Optiver, National Stock Exchange, the Securities and Exchange Commission, Shanghai Futures Exchange, Taiwan Futures Exchange, and Zhengzhou Commodity Exchange.